Originally established in the 1970’s as a self-erecting tower crane rental company, Falcon Tower Crane Services Ltd as it has now become known, has evolved from a regional tower crane supplier to the largest independent tower crane supplier, with an international brand, selling and renting tower cranes all over the world. When we established a transport department one of our goals was to achieve FORS Gold in a short period. Our Transport Manager knew of FORS from his previous employment, and he insisted that FORS should be one of the first things on our agenda. 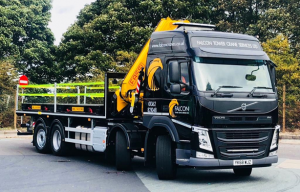 Health & Safety has always been our number one priority, and joining a scheme that promotes road safety, improves sustainability, leaving less impact on the environment is a good thing for all those involved, and Falcon wanted to be a part of it. All our vehicle fleet is equipped with the safety equipment laid out in the FORS standard. The picture below is a photo of one of our vehicles with the safety features. Falcon tower crane services Ltd passed the FORS Bronze audit first time round, which was a great achievement due to the relatively short amount of time that we have been established. We have gone from having no recognised accreditations in place to being up to a standard that is recognised throughout the industry. Once we gained Bronze, we decided to go straight for Silver and then for Gold. It was one of the main targets identified as needed by the Transport Manager when he came into Falcon. Having the Standard in place means we are conducting our day to day business not just professionally but to a set standard recognised and adhered to within the industry. We are trying to reduce our impact on the environment and are actively promoting safe practices which gives our employees an increased awareness of the dangers on the road and in the workplace. Once accredited, we have really made the best possible use of the FORS online training section for eLearning. All our drivers have completed an online course, and as part of their continual development, they will complete one every 12 months. This has extended to the transport department office staff all of whom have completed the online courses. Our drivers and field staff have also attended the Safe Urban Driving Training, which was booked through the FORS website. We have made use of the class room courses that FORS offer, and we now have two FORS practitioners; a Road Risk Champion and Collision Investigator. We use the FORS toolkit to brief our drivers when we conduct toolbox talks. The guides section has been useful as we have implemented some of the content into our transport policy. We have adopted the professional development plan in the FORS standard and have added items to this to ensure that our drivers are continually developing their skills and learning. As part of the plan, we have mandated that all HGV drivers are to be driving assessed every 6 months by our in-house driver trainer. This gives the Company peace of mind knowing that the highest standards are being met and maintained. As a company we use an application called POD-father. All our employees have downloaded this application to their smart phones, and this is used daily for the employees to conduct their walk around checks. Any defects are annotated on the app which in turn is monitored at the office whereby any action required can be implemented immediately. We have a contract in place with ATS, which enables any of our employees to have their tyres checked for serviceability and the correct pressures at any time. Our Company Policy is to change tyres at 3mm and not the legal limit and only use Michelin premium tyres. MPG-miles per gallon has decreased by 20%, this is down to driving more efficient. We have a telematics system that’s fitted to the vehicles that monitors driver behaviour RTI’s- the incidents are down 33 % We cover a lot more miles than we have previously. CO2- decrease of 8.62%. NO2-increase of 75% due to the number of extra miles we are covering which in relation to the number of vehicles we had last year is an improvement. PM10-decrease of 20.6%, due to the extra mileage covered. This is an improvement. Alternative fuels- No change as we do not use any. Driver health and fitness reviews: Every 3 months our drivers fill out a disclaimer regarding any medical conditions that may prevent them from being fit to drive. They also have a basic eyesight test in our transport office. Medical examinations are every 3 years, however once an employee reaches 60 years of age, these are conducted annually. The engineers have a ‘Safety Critical Working at Height Medical’ every 2 years. The medicals are carried out by an independent medical adviser, and they follow the guidelines as outlined by the ‘Strategic forum for plant safety group’. Some job roles within the company may require medical screening to be carried out annually. Recruitment of drivers:- All our vehicle fleet are new, well maintained and serviced regularly. The vehicles are always clean and presentable, and we offer our employees attractive rates of pay. We also operate on a four day on four day off rota. This ensures that our drivers are always well rested. We have no problems in recruiting new employees when required. Falcon prides itself on a Company that provides new, fully serviced and roadworthy vehicles; promoting as a major key point Safety, with a well-constructed working regime giving plenty of downtime and paying a competitive wage. Noise assessments: we use an application called quiet night to monitor the amount of noise pollution we have on site, which is recorded weekly from different locations. Our employees are briefed to keep noise to a minimum, ensuring that engines are turned off when loading and unloading on sites. In our operating centre in Shipdham we have a purpose-built vehicle park sited away from all the other departments/yards on site again enabling noise being kept to a minimum. Modal shift and alternative vehicles:- Falcon is a Tower Crane Company based in Norfolk, delivering tower cranes to construction sites all over the UK. We have investigated other modes of transport; but this is not feasible due to our geographical location. We are not situated near a rail head and do not need to ship anything by water. The sheer weight and abnormal loads means it is easier and cheaper to transport our product by road. We also work to strict time scales. If a part of the tower section turns up late or doesn’t turn up at all it has massive financial implications. That’s one of the main reasons we purchased vehicles in the first place. In order to make continual fleet improvements, Falcon are looking at Volvo’s FH LNG gas powered trucks. These produce the same performance as a diesel engine but with 20% less co2 emissions. There is a slightly higher priced alternative which uses Bio gases and reduces the CO2 footprint by 100%., and these are the most environmentally friendly vehicles on the market. We currently have euro 6 engines in all our heavy goods vehicles, thereby reducing the levels of harmful exhaust emissions and helping to improve air quality and are continuously looking to advance upon this. An area in which we are wanting to improve upon this year is to reduce road related incidents. We have looked in depth at our driver continual development plan and we will be able to provide more in-house training, driving assessments every 6 months and more FORS e-Learning courses. This will educate our drivers and make them more aware of the dangers associated on the road. We have positively promoted FORS by adding our FORS achievements to the company website, Our FORS id is also advertised on LinkedIn. Falcon produces a newsletter every quarter and FORS is mentioned in there. The transport department have added the FORS logo and ID to their email address bar. All the certificates achieved so far are on display in our foyer so any visitors can see them. Achieving the FORS Gold accreditation would be a huge achievement for our company. We aim to give our customers the highest service that can be provided and having the FORS Gold standard shows our intentions as an organisation.